GILGIT, Sept 1 (APP): Chief of the Army Staff General Raheel Sharif Thursday said the Pakistan Army would go to any extent for ensuring the security of the country. 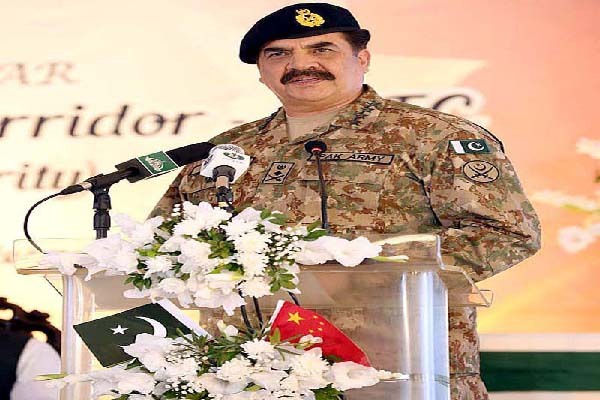 The COAS was addressing the concluding session of a two-day seminar on China Pakistan Economic Corridor (CPEC) project here. He said terrorism was a very big challenge and Pakistan was the only country which overcame it. Gen Raheel told about the progress made during the operation Zarb-e-Azb. “Whatever the world thinks, this is war of our survival and we will fight it like this,” he said. The security of China Pakistan Economic Corridor project would be ensured at all costs, he added. He said there was no doubt that nobody was more hard working than the people of Gilgit-Baltistan. leadership wanted progress of Gilgit-Baltistan similar to that in China’s city Urumqi and other regions. The Army Chief said that a security division for the protection of CPEC project had been established in the North and the same kind of division would be set up in the South. This task, he said, was made possible through tireless efforts and commitment of the government. “Our commitment towards the completion of CPEC is visible,” he added. He said 22,000 civilians and 5,000 law enforcement personnel, including police, Rangers and FC Jawans lost their lives in acts of terrorism and 48,000 received crippling injuries. The Army Chief said he was fully confident that the youth would carry forward the mission of peace and prosperity. “The way youth welcomed me I want to tell them that Pakistan Army is your army. Army is working for the well being of the nation,” he said. General Raheel Sharif announced start of work on a technical institute which will have capacity to train 350 students and in future upto 800 students. A modern medical city will also be established for providing health facilities to patients including cardiac patients besides provision of medical educational facility, he said. He said a campus of National University of Science and Technology (NUST) would also be established in Gilgit while uplift of Jaglot-Skardu road would also be undertaken. Later, he interacted with the youth of Karakoram International University.